“Ding dong” went the bells and the deed was done! 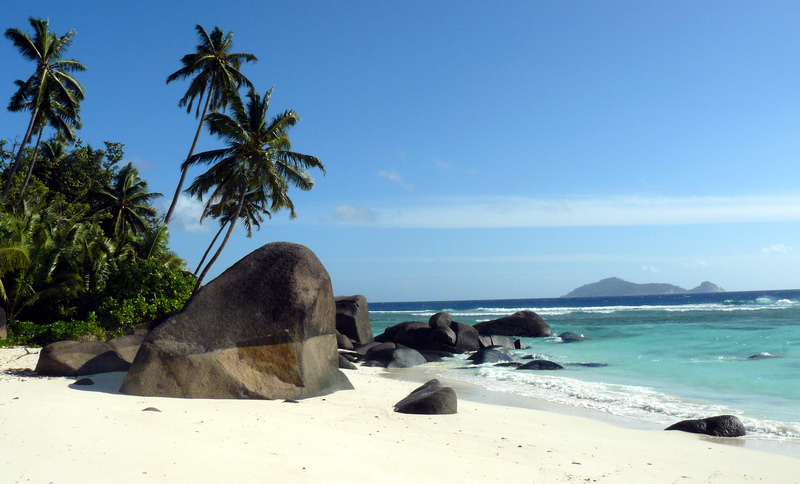 We were married and in the very beautiful Seychelles for our honeymoon. 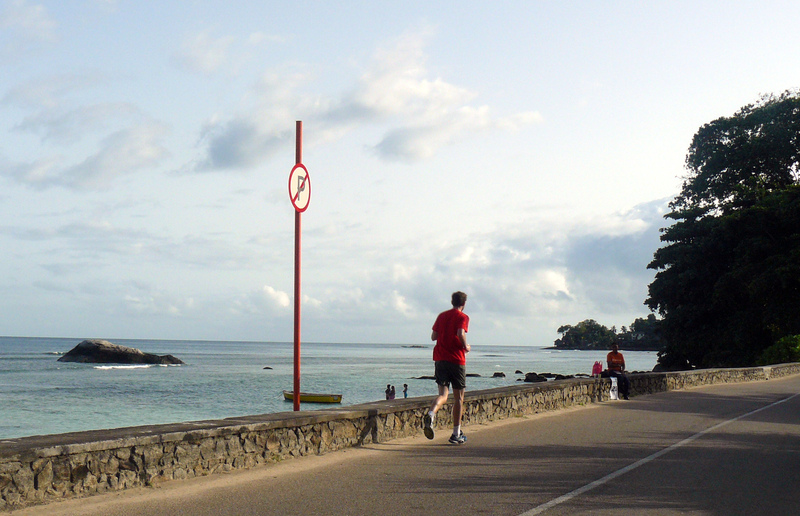 In between selling suspiciously shoddy seashells on the sea shores of the Seychelles, I had – as would any obsessive person, organised a half marathon run for me. The views were ok …. 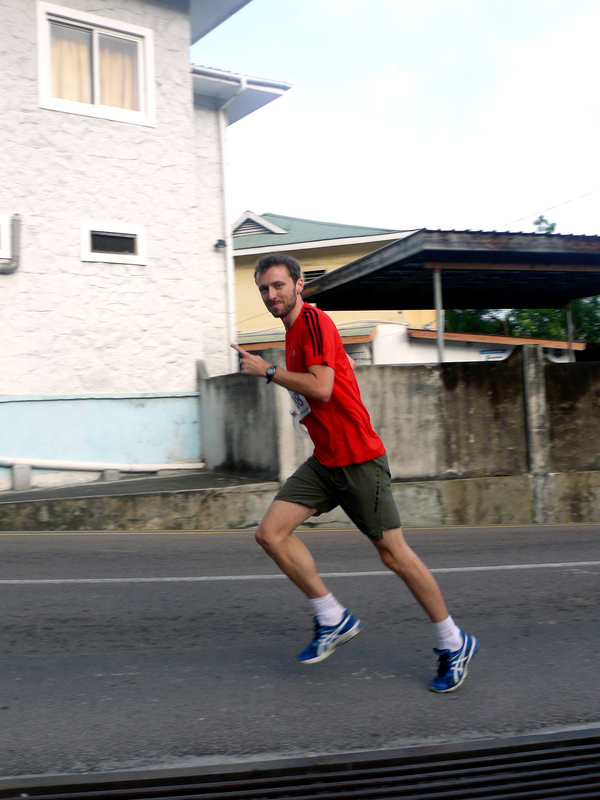 About 3 months before we flew out, I had been in touch with the Seychelles Marathon Committee. 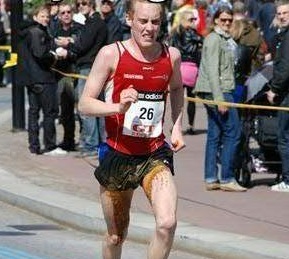 I knew their annual marathon had been in February but I hoped they could send me the half marathon course. I could then run it alone or, if anyone else wanted to come with me, with a few locals. I was delighted to quickly receive a very helpful reply from one of their committee members, Giovanna, both with the half marathon map and the promise to look for a few runners to come with me. Without a doubt, the setting for the run was one of the most scenic and beautiful ones I will run in over the course of the 80 runs. Lush tropical rainforests, beautiful pristine white sandy beaches, glorious sunshine, you couldn’t ask for much more really …. except maybe a healthy stomach. Whilst I’m not expecting any sympathy as it didn’t stop us from doing anything on our honeymoon, I developed what became the most prolonged severe (and violent) stomach bug I’ve ever had on our flight out from the UK – talk about sod’s law! I expected it to be better for the run 5 days later but, well, it wasn’t! However, I knew how much effort Giovanna had put into organising this race for me and I didn’t want to let her down so I braved myself to at least run 10km which, I am sure, would still have gone against all sensible doctors’ advice but a challenge is always fun…! Uhhu. What I didn’t know however was quite how much effort she had put into the race. This was both humbling by its generosity and, for any British person who doesn’t like to be the centre of attention, slightly mortifying! 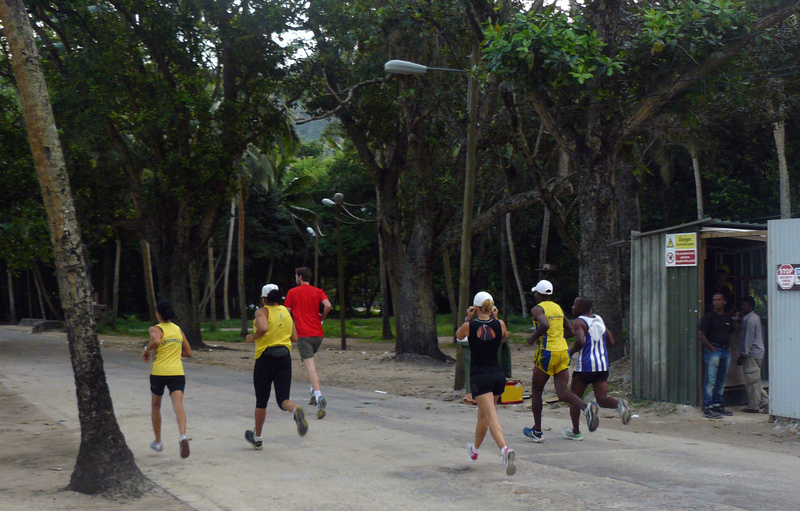 As we approached the starting line, I had expected to see a few casual runners awaiting an informal run because, well, I really didn’t think I was important enough for any more than that. I was therefore surprised and humbled (and slightly worried about the effort which had been made for me!) when, after seeing the runners, I noticed the first volunteer with an orange tshirt…then the second…then the third…..then the tenth! I laughed nervously in the car with Pippa until I spotted the official photographer next to a proper starter gun. This was the moment where I’d realised Giovanna and her team had shown incredible kindness and thoughtfulness and organised an actual half marathon for me! I explained my slight medical predicament and, once the official police motorbike had arrived to close the roads in front of us (! ), we were off! Whilst all I wanted was an epidural and a bed, I was fully aware of the effort Giovanna’s team had put into organising this run and there was no way I wouldn’t at least complete 10km, even if I had to walk most of it (which I did). 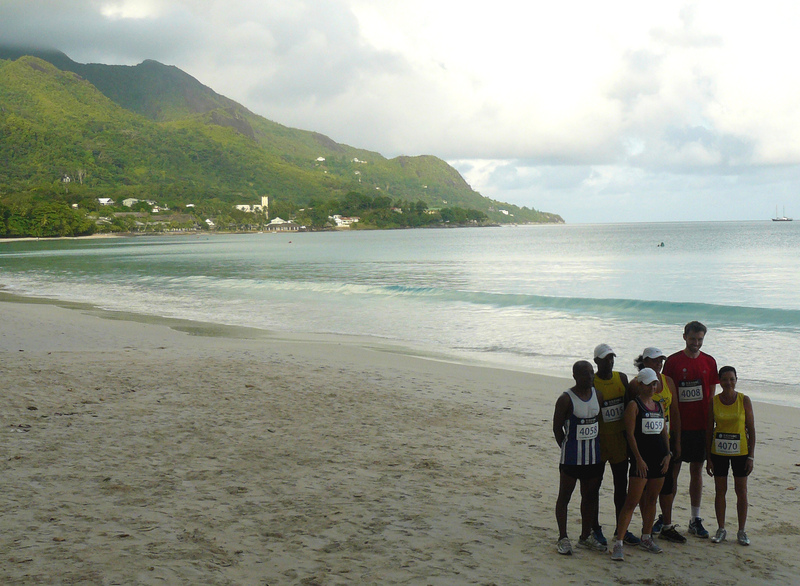 The course took you back to Beau Vallon and winded its way up the West coast to the North of Mahé, just past Anse Machabee. 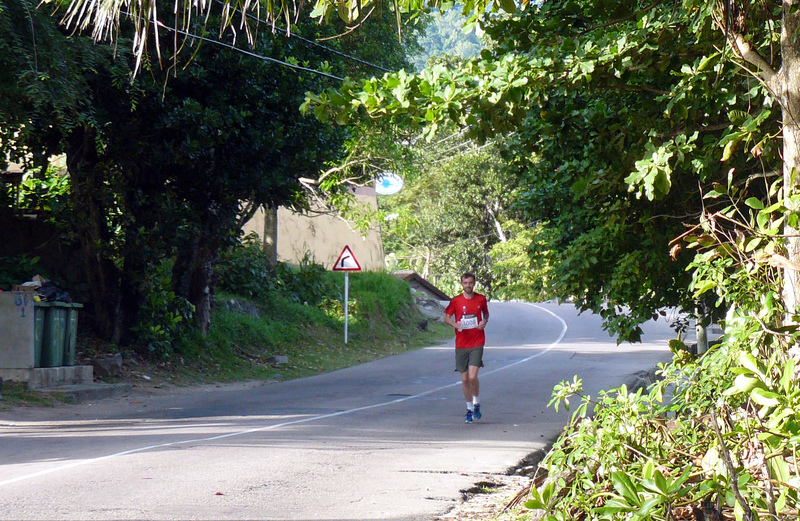 The views were stunning and, with volunteers lining the route with refreshments, I (despite my ailments!) was thoroughly enjoying the run. Logic prevailed however and I decided to only stumble along for 10 kilometres. In the end, I ended up finishing the 10k run in almost the same time it would normally take me to run a half marathon (!). I was so dehydrated that my wee smelt and looked like that of a wolf in heat but my spirits were high. Looking on the bright side too, I technically won (and lost!) my first race here as I was the only person to have run 10km! Go me! 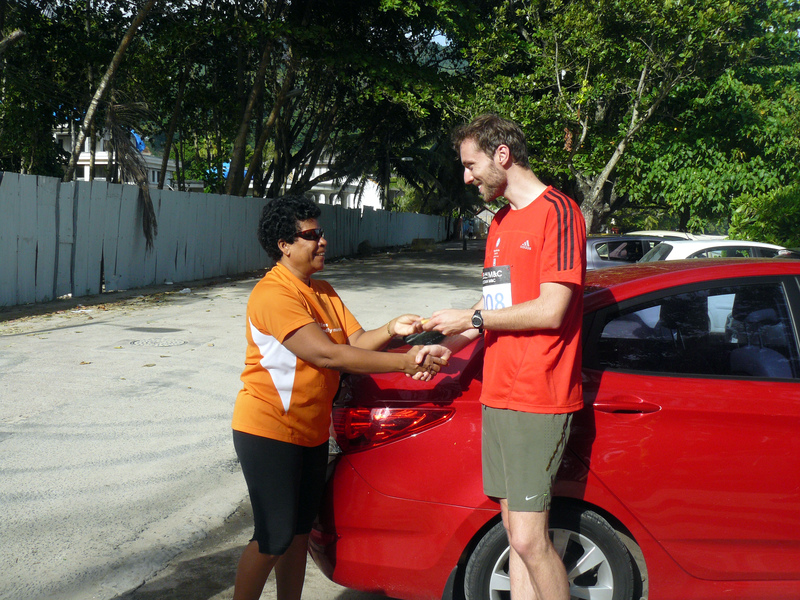 Overall, the ‘Seychelles Eco-friendly Marathon’ race was an incredible experience – it was certainly eco and exceptionally friendly and I can only recommend it to anyone looking for a slightly different run in a tropical paradise. Sheepishly accepting a medal from Giovanna – thank you! Many thanks once again to Giovanna’s team – I will be eternally grateful for their efforts and will equally remain in admiration at such generosity! Final Time: Slow….! Let’s just round it up to 75 minutes!